Until recently, JTEKT Torsen® offered support to FSAE teams in the form of a University Special Differential, part number 012000. While we are no longer able to make these available to student teams, we are aware that there are quite a few teams still operating University Specials differentials. For that reason, we will continue to make the FSAE support information available on our website. This information is provided for reference only, no University Special differentials or components are available for sale. What is the part number of the new unit? The current one-piece housing differential part number is 012000 and replaces the older two-piece housing design (part number M021-DHU). When ordering this new differential, please order it by the current part number! How much torque is the University Special designed to handle? The University Special can handle 5,200 N*m of sprocket (or ring gear) torque. When calculating sprocket torque, be certain to account for your low gear and final drive ratios. What should I use for lubrication? A GL-4 or GL-5 gear oil is required by Torsen Type 1 units. This oil provides high-pressure additives needed to prevent the oil from breaking down under the extreme conditions generated by the tooth mesh. A 75W-90 is recommended, but higher or lower viscosities can be used if they meet GL-4 or GL-5 specification. Either synthetic or conventional oils can be used as well. Can the University Special be packed with grease and sealed? Not recommended. Grease does not typically provide the high-pressure additives required by the gearing. See: What should I use for lubrication? How much oil should I put in the University Special? The University Special differential should be half to two-thirds submerged in oil for proper operation. We cannot recommend a specific volume of oil, as the housings and oil capacities used by the different teams vary greatly. We can however, suggest that allowing greater oil volume allows greater cooling capacity. What does the University Special weigh? The unit tips the scales at 8 lbs. and 10 oz. as shipped for the M021-DHU, and 8lbs. Even for the 012000. Where can I get the data for the University Special’s large input spline? The data for the input spline is available by clicking this hyperlink, Download a 012000 General Fact PDF file! As most teams do not use this spline, the data was omitted from the 012000 drawing. What is the original application of the University Special? This differential is derived from the center differential used in the1988 – current Audi quattro. The unit was specifically used in the following models: the 80, 90, 100, A4, and A6. This is used in the 5 speed manual transmission ONLY! Because the differential is physically within the transmission itself, a spline shaft, NOT a ring gear, drives it. 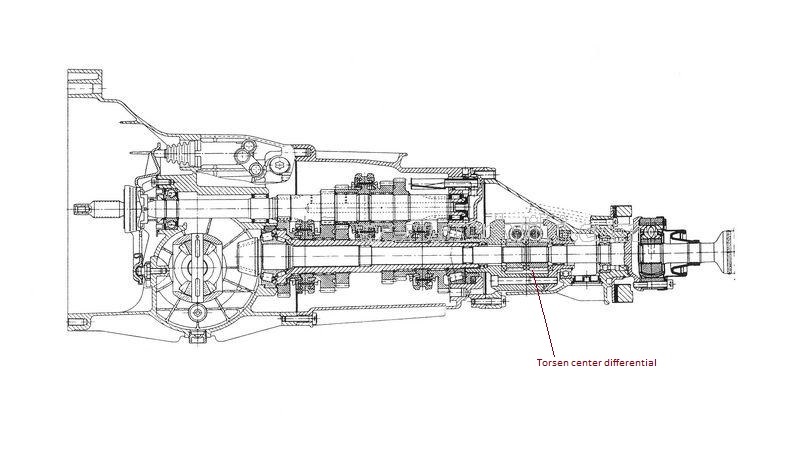 Click here for a picture of the differential’s location. How can I mount the sprocket and rotor to the differential? For the 012000 unit, there are a few options. If you are making your own housing, then you can mimic the two former piece design using the new unit’s internal dimensions. If you use the new housing then you can add tapped holes to either end to mount the sprocket and rotor. Another option is to drill holes into the housing in the same locations as the “old” University Special. Please remember that the housing is made of hardened cast iron! If you are still using the M021-DHU unit, then there are several ways to approach this; the most popular uses the differential’s 3 cap bolts to mount a sprocket as well. Longer bolts are required to do this. Also, many teams add a brake rotor to the differential, opposite the sprocket. Both can be attached by through-bolting the entire assembly. Other methods include making a stub shaft, splined to fit the drive spline on the end of the differential. This shaft can be flanged to accept a sprocket. Another possibility is to machine your own housing, adding a mounting flange for the sprocket. How do I take the 012000 apart? The new unit has Spirol pins in place of the “old” units drop pins. The best way to remove the pin is to notch the Spirol pin with a rotary tool and then use a small chisel to work the pin out of the retaining section. You can work the pin out by placing the chisel in the notch and by holding the chisel at an angle hitting it repeatedly until the pin releases. This task can be a difficult one and you will need some time and patience. Can the University Special be modified to increase performance? Yes, to some degree. Since performance (torque bias ratio or TBR) is a direct function of the unit’s internal resistance to differentiate, changing the resistance will change the TBR. Most of this resistance comes from the gear design itself, and cannot be altered. However, there are other frictional factors that can. One of these factors is the friction coefficient of the washers, which the side gears thrust against when torque is applied. We use a variety of different washer types to adjust the TBR. Higher friction washers include plain steel, steel with nickel plating or FNC heat treating, and hardened bronze. To reduce friction, we also use needle bearings as well as washers with a Teflon-based coating. For the 012000, the torque bias ratio is about 2.6:1 in drive (throttle-on) and 4:1 in coast mode (drop-throttle/reverse) if the differential is mounted in the car with the large input spline toward the left (normally considered driver’s side). Switching the thrust washers that are situated between the side gears and differential housing end for end will reverse the torque bias ratio for drive and coast modes. This gives a drive mode increase in TBR that is normally favorable for this type of car. If the large spline is on the right when installed in the car, then the washers are already in the correct location to do this. For the M021-DHU, the needle bearings between the side gears and housing/cap can be replaced with steel washers of the same dimensions. Another variation would be to replace only the bearing on the left side of the differential (as installed in the car) with a steel washer. This may offer a better balance of performance between throttle on and off. Using less viscous oil will also raise TBR. A more viscous fluid will lower it. If you are changing the oil, be sure that you still use a GL-5 specification lubricant. Are there any special design considerations for incorporating the University Special into our car? You need to be able to drive the differential, and you need to keep oil in it. Be sure to seal the unit well, so the oil will not leak. You will need a way to fill and drain the unit. Also, if attaching a brake rotor to the differential, be sure to keep the unit cooled off. Brake rotors can generate high temperatures, and the differential becomes a heat sink. Usually gear oils should not exceed 250 degrees Fahrenheit for extended periods of time, or they risk thermal viscosity breakdown. Can weight be removed from the University Special? Yes. We’ve seen units as light as about 6 lbs. This can be achieved by manufacturing a unique housing out of aluminum. While this is not normally recommended, several teams have shown that this can work rather successfully. Also, other teams have removed substantial amounts of weight from the stock housing. Be certain to do a detailed finite element analysis when making any changes to the housing and cap. How do I keep the oil in the University Special? A popular method is to make a sleeve that covers the housing, and sandwich it between a sprocket and a rotor. Some teams build a unique housing that closes the unit up. Does Torsen provide a sleeve or housing to seal the University Special? No. We provide only the differential itself, how it is integrated into the individuals teams’ cars is strictly up to the team. It follows, then, that determining the best method of sealing the University Special is the team’s responsibility. Can I build the differential with only two of the element gear pairs? This is not recommended. Attempting to build the differential with only two pairs of element gears, arranged 180 degrees apart, will create timing errors in the gearing. In a vehicle such as a Formula SAE car, the differential may actually survive for a while as such, since the cars are lightweight and have only small torque outputs. Assembly with the gearing 180 degrees apart is very difficult to “time” and without correct timing, the unit will eventually fail (refer to question 14). Where can I get Spline shafts? 1. Use the OEM Audi output shafts, obtained from Audi or a salvage/junk yard. 2. Manufacture your own to the Spline specification given on the M021DHU General Fact PDF file (Older Differential) or the 012000 General Fact PDF file. When using OEM shafts, the rear output shaft is recommended due to its shorter length. What parts do I pull from a junkyard car? The Torsen differential in an Audi quattro is located in the vehicle’s transmission. The shafts are also part of the transmission assembly. There are two shafts, the front output and the rear output from the differential. The rear output shaft exits the transmission tail shaft, bolted to a flange. The front output shaft is internal to the transmission and is much longer then the rear output shaft. The front output shaft has an axle pinion gear forged on the forward end. Either shaft has the correct spline, however the rear output shaft is more widely used. Can I attach a brake rotor to the University Special? It is fairly common for the brake rotor to be attached to the differential. This will not affect the bias ratio directly. The gearing will bias whatever torque is applied to them and the bias ratio is unaffected by how that torque is applied. If the brake is used while drive torque is still being applied, then (depending on the actual magnitudes) they will cancel each other out before the torque reaches the differential gearing. If a sprocket/rotor is used, then the brake simply cancels the input drive torque. However, if the rotor is placed on the opposite end of the differential case, then the simultaneous application of both brake and throttle will create a torsional load on the case. Depending on how much the differential case has been modified for the application, this could potentially cause enough deflection in the case to cause the gearing to tend to bind. That would, in turn, have an impact on torque bias ratio. Consequently, any modeling or analysis of housing torsional bending that can be conducted should be done to ensure a suitably still case. Regarding heat build up, well, brake rotors are heat sinks. If it’s attached to the differential directly, it will transfer heat into the differential. This will not harm the gearing itself, but it can potentially cause an issue for the lubricant in the differential. Since the oil capacity in the differential is small, that oil will heat quickly. Many oil additives are cooked out of the oil around 325-350 degrees F. If oil temperatures are sustained above this then the oil can possibly break down. That, of course, will lead to damage to the differential gearing. If it possible to thermally isolate the rotor from the differential, that is worth considering. Also, it is possible – however unlikely – that a differential-mounted rear brake can fail to contribute to stopping the car. If the driver were to apply the brakes heavily while a rear wheel is lifting/bouncing off the ground (either due to a bump or dynamic weight transfer), then the differential gearing will allow the wheel on the ground to still roll forward even if the rear brake is locked and the diff case has stopped. For this to occur, however, the raised wheel would have to reverse direction and roll in the opposite direction in a 1:1 ratio with the grounded wheel. If the lift was only momentary, the raised wheel’s forward inertia will make it difficult to lock the rear brake. As long as all four tires are on the ground during heavy braking, then the rear brake should function normally. Is there any sponsorship or discount for FSAE teams? While it is true that in the past, JTEKT Torsen North America, Inc. was able to give the University Specials to teams, it is no longer possible to do so. However, we do sell them at the discounted price of $415. Please check the ordering page for the latest pricing information. For comparison’s sake, it could cost up to $1600 to purchase this unit from an Audi dealer. What would the cost of the differential be on an individual basis? Type 1 (T-1) University Special (012000), the assembled unit cost is $495.00 each. Teams using a Type 2 (T-2) differential, the assembled unit cost is $420.00 each. PLEASE NOTE: This does NOT effect our actual selling price of the T-1 University Special. The price is the same as before! This pricing structure is ONLY for use in the cost-reporting event! We DO NOT SELL INDIVIDUAL PARTS and we DO NOT SELL A T-2 UNIVERSITY SPECIAL, please read below on how to acquire a T-2 differential! What is the cost of just the gear set for the University Special? Teams who chose to design and build their own custom housing have often inquired as to the cost of just gearing. Review the above table for pricing structure. Also required for assembly is the thrust washers and bearings, which can mostly be purchased as catalog items (see the M021DHU General Fact PDF file and the 012000 General Fact PDF file), as well as journal pins, and drop pins. The pins can be manufactured elsewhere and cost outlined as per the SAE competition rules. Please keep in mind that we DO NOT SELL just the gearing, we sell complete differentials! Are there other differentials, such as a Type 2 (T-2), available to FSAE teams? At the present, the Type 1 University Special is the only differential and drawing that we can supply to FSAE teams. While this may change in the future, a team wishing to use a Type 2 must currently go to a junkyard or a car dealer’s parts counter. We cannot supply a drawing for any other differential other than the University Special. If you choose to use a Type 2 then you will have to do all your own design work. Two good possible choices would be the Mazda Miata (1996 – 2002), or the Toyota RAV4/Lexus RX300 (rear only). Both of these applications are fairly compact (ring gear pitch diameter is approximately 7 inches) and can be made quite light. Also, there are two aftermarket Torsen Type 2 differentials that are fairly well suited, both sold through the Ford Racing Performance Parts catalog. These differentials are for FWD applications, one for the Ford MTX-75 transaxle (Ford PN: M-4204-F20) and the other for the Getrag 6-speed transaxle used in the SVT Focus and Mini Cooper S (M-4204-SVTF. Of the two, the SVT Focus differential is slightly more compact and lighter, however both are good options. Advantages to using a Type 2 are: all machining work for the housing is single axis, simplifying housing construction, the gears require no timing to assemble, the unit can be put together quickly. If you are making your own housing, it can be made with no windows, simplifying sealing the unit from oil leakage. Also, Type 2 differentials can use almost any type of lubricating oil, including automatic transmission fluid. 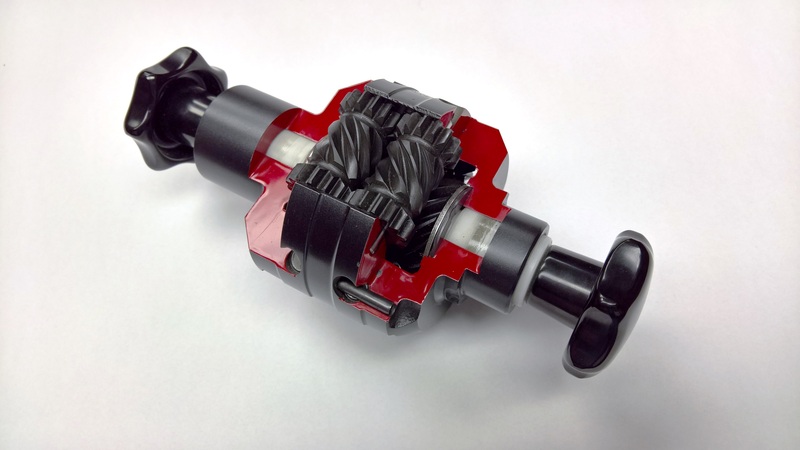 Another advantage of using a type 2 differential is lower cost in volume production. The Type 2 would cost $280 each for a run of 1000 units for either of the two mentioned above. Gear costs are $19 per side gear, and $9 per planet gear. The drawback to the Type 2 is a lower torque bias ratio than the University Special. Adding clutch plates to the side gears can increase TBR. The TBR would then likely be higher than the University Special. What is the differential’s housing? The housing is the differential’s main body where the internal gearing and washers are placed into. What is an “element” gear? Element gears are the smaller gears, which have the spur teeth as well as helical teeth. These are arranged in pairs to connect the sun (or side) gears to each other and to the housing. What does torque bias ratio mean? Torque bias ratio (TBR) represents the “locking effect” of the differential. More specifically, it indicates how much more torque is sent to the high traction wheel (or axle) then it is sent to the spinning wheel. For example, when a differential has a TBR of 3:1, 3 times the torque the spinning wheel can maintain (75% of the total torque) will go to the higher traction wheel. If a wheel is spinning and can support 100 lb-ft, the other wheel will get 300 lb-ft.
What is the torque bias ratio of the University Special? When shipped the torque bias ratio (TBR) is approximately 3.2:1. After break-in, it stabilizes at about 2.6:1. Can the torque bias ratio be tuned or changed? Yes, see: Can the University Special be modified to increase performance? What does “timing the differential” mean? The timing refers to the orientation of the spur gear teeth on the ends of the element gears in relation to the helical teeth. The differential must be timed properly – that is, the gears must be orientated together properly to operate correctly. How do I time the differential? The timing information is given in the Timing Chart in the lower left-hand corner of the M021-DHU print. Windows 1, 2, and 3 refer to the element gear windows, viewed from the top, in the counterclockwise direction. Install the bottom gears first, around the side gears. Start with each gear’s timing mark straight upward, on the left side of the gear. Rotate the timing mark toward the outside of the differential the number of teeth given in the Timing Chart for each gear. Repeat for the top element gears. When completed successfully, the differential should roll (differentiate) freely. What will happen if the differential is not timed properly? Proper timing is required for equal load sharing among all the gearing. It is possible to build the differential incorrectly, and have it still roll (with some difficulty). However, the internal loads will not be evenly balanced among the gears, and some will be severely overloaded. This will lead to eventual failure, often catastrophic. What is different about the old University Special differential? The old style differential was replaced by a design that handles more torque and weighs less. The most obvious difference on the M021-DHU is the use of a two piece housing. This resulted in a separate cap and three cap bolts. The M021-DHU gearing also has a somewhat lesser torque capacity. The gearing in the M021-DHU is entirely different from the current 012000 and are NOT interchangeable. Is anything in the “old” University Special the same as the 012000? The axle spline, exterior dimensions, and pricing have NOT changed. You should be able to use the same axle shafts and differential mounting as the previous unit. Why was the design changed? The University Special has always been based on an existing production design and since that design changed, so did the University Special. Can I still get the “old” University Special differential? Unfortunately, we cannot supply the older differential because we depleted the old inventory prior to stocking the newer differentials. This applies to both the M021-DHU as an assembly as well as components for it. You can download the M021-DHU print by clicking here! Can I use the gears from the 012000 differential in the “old” M021-DHU housing? Unfortunately, the gears are different between the two units and are NOT interchangeable! I am a student, so how do I get a drawing of the University Special? The drawing for the 012000 University Special is available on this site as a Portable Document Format (PDF) file. Locate the link at the top of the page or click here. You can also download / view the older M021-DHU drawing by clicking here. How do I order a differential? Just click here for ordering instructions! Since January 9th, 2008 the price for the Torsen University Special unit has been $415 USD. How can I get replacement washers and bearings for the University Special? Most of the bearings and washers are available from, or can be made from, standard INA or FAG components. The thrust bearings are drop in replacements, and the steel washers require reworking to be used. However, there is no commercially available replacement for the bronze washer. If this requires replacing, it can be made from steel to the same dimensions. See the M021DHU General Fact PDF file or the 012000 General Fact PDF file for specific size information. Are pictures available of the new University Special? Yes. If you would like to see the 012000 prior to ordering you can view a photo of a cut away version by clicking here! Can I order a replacement side gear/journal pin/washer/etc for my University Special? No. Unfortunately, we do NOT offer replacement components for the University Special on an individual basis. These differentials are stocked as complete assemblies. We do not keep individual components in stock. How do I e-mail an engineer and ask specific questions? Click on the e-mail address below to send your specific question to a Torsen engineer at info@torsen.com. Type-1 (T-1) University special (012000), The assembled unit cost is $495.00 each. Please Note: This does not affect our actual selling price of the T-1 University Special. This Price Is the same as before. This pricing structure is ONLY for use in the cost-reporting event. We DO NOT SELL INDIVIDUAL PARTS and we DO NOT SELL A T-2 UNIVERSITY SPECIAL, please read below on how to acquire a T-2 differential.